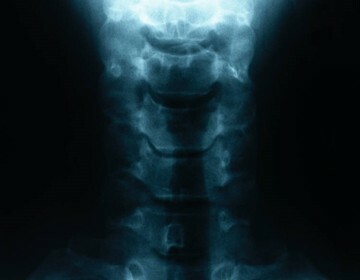 The neck is a very fragile and unique area of the body as it contains the cervical vertebrae. The cervical region of the neck is the most common injury area in automobile accidents. The syndrome Las Vegas personal injury attorneys deal with frequently is known as whiplash where the neck is thrown in multiple directions shifting the normal curve of the spine and stretching ligaments and tendons. The human head weighs approximately 15 lbs and is supported by the spinal column. As we age, the bones become more brittle and actually calcify creating degeneration. This degeneration can become a catalyst for disc compression leading to nerve impingement, bulging discs, herniations, and annular tears. Just the same, these conditions can also be caused by trauma like a severe or moderate car accident. Cervical injuries are normally treated with physical therapy to reduce the inflammation of the muscles and hopefully increase the strength of the supporting tissues. Chiropractic treatment is often a good therapy as both the inflammation and alignment of the vertebral structures can be worked on. If the pain does not subside, and a person has other symptoms such as tingling, numbing, or other odd sensations in the arms and hands then an MRI must be ordered to determine what level a possible disc disruption has occurred. Upon locating the area of the injury, an orthopedic or neurosurgeon will likely order a set of injections to see if that relieves the problem. Those injections are a (2) part process in that cortisone is injected as an anti-inflammatory as well as a diagnostic tool as patients who receive a benefit then know whether the appropriate disc was targeted. Other tests may also be ordered such as a disco gram or nerve conduction study. These tests are then compared clinically with the patient's complaints to reach a course of treatment. If these options fail then surgery to correct the problem may be ordered. Cervical injuries can be fatal if enough force is too much for the neck or body to handle. Compression or cutting of the spinal cord can occur. SPI or spinal cord injuries can range from C1-C7 where the thoracic segment begins. Injuries at the C-1-2 levels will often result in loss of breathing. C3 and above will typically result in the loss of diaphragm function, necessitating the use of a ventilator, C4 results in significant loss of function at the biceps and shoulders, C5 results in potential loss of function at the shoulders and biceps, and complete loss of function at the wrists and hands. C6 will affect the wrist control, and complete loss of hand function. C7 injuries will cause a loss of dexterity in the hands and fingers, but allows for limited use of arms. The most common injury in rear end car accidents are cervical sprain and strains. These injuries begin with a sharp pain in the neck, and continue with shoulder, trapezius, and upper back pain. Headaches can also be a classic symptom of cervical sprain. Most cervical strain and sprains will get better with time and are very responsive to therapy. Ice packs are a great idea to reduce the inflammation as well as plenty of rest. If you have been a victim of whiplash or a cervical neck injury, contact the Las Vegas personal injury offices of Benson & Bingham and ask for Joseph L. Benson II, Esq. : 702-382-9797 x. 226. The Cervical Region is the Most Common Injured Area in Automobile Accidents.